It’s been one month now since we’ve launched on Steam Greenlight. Time to give you an update: we’re at 91% of the way to the top 100. So close and yet so far. Unfortunately, daily votes for us have slowed down considerably by now, so if you haven’t casted your vote yet, please do so here and share the link with your friends. Thanks! On the bright side, we’ve made great progress on the game itself these past two weeks. We now have actual persistent campaigns and no longer just separate combat scenarios. Also, Greenskins! Battle Brothers consists of two major parts, the tactical combat and the strategic worldmap. So far, both of those have been existing more or less on their own. The tactical combat was prototyped first and tested by many of you in our combat demo to get the fighting right. The strategic worldmap simulation has also had a life of its own over the past few months – villages trade, bandits raid and militia struggle to keep order, all without much player involvement. Now, finally, we’ve connected both of these parts. We’re now able to play an actual campaign and take the same band of Battle Brothers from battle to battle as we roam the world. Whether we’re engaging our opponents in a forest, in a swamp or on a road leading over plains on the worldmap, the procedurally generated tactical combat maps reflect this. They also change their ambient lighting to match the time of day on the worldmap. Weather isn’t in yet, but it will soon follow! Of course, we can also keep the equipment we loot between battles and the experience our Battle Brothers gather from battle now has actual meaning. 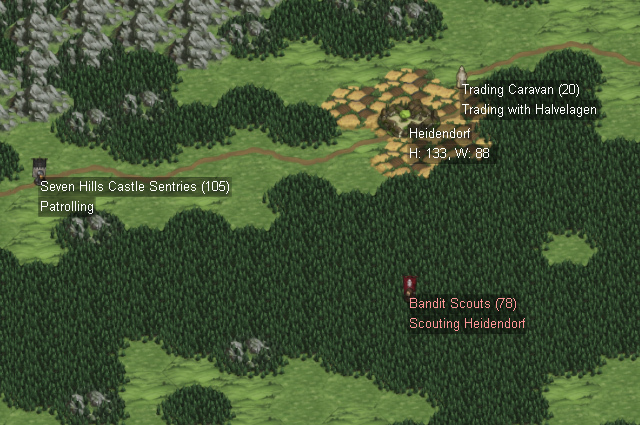 The campaign can now also be saved and loaded at any time on the worldmap. So, milestone reached. The next step to a complete game. While all of that was going on, we also finished the design on Orcs and Goblins. We’re very happy with how they turned out – they have a lot of unique mechanics, their own equipment and behavior. Orcs and Goblins fight very different from each other, and very different from the Undead. Also, just like Battle Brothers, they are subject to fatigue and morale. We’ll give a proper introduction to Orcs and Goblins in separate blog posts, including some of their lore, units, skills and equipment. For now, have a teaser of a goblin with and without heavy armor. Also, if you’ve played the combat demo in and out, feel safe in the knowledge that our upcoming Early Access version will allow you to fight a dozen different Greenskin variants and no longer just the Undead! Will the weather have any effect on warriors? Quite possibly. We have things like fog limiting the view range and heavy rain lowering ranged weapon accuracy in mind. Also, night time will lower the view range for most characters, though some predators may be unaffected and some opponents, like vampires, may even benefit from night time. Looking very good guys! Too bad you cant get a kickstarter or some other form of paid beta going since I think there is plenty of us who would like to test and come with suggestions about balance and functionality. What I’m trying to say in short: Give me that campaign now, I want it! I am so so excited. I keep sharing your green light on my Facebook in hope that you get some additional votes. 91% is so close! I cannot tell you how excited I am, especially to see the green skins, I love some goblins and orcs. Would love to see some ogres and trolls at some point. Maybe a naga/swamp based faction kinda like the merlocs from WoW? ps. I’ve seen some criticism on the green light regarding the compromise over animations. It’s not gonna be everyones cup of tea, and you cannot please everyone. At least you’ve managed to capture a realistic feel while achieving a board game style aesthetic (it has a nice irony to it). Personally I’m in love with it. Just don’t be too bummed out by the opinions of those that are not swayed. Either they’ve not played the demo, or buy games with graphics/animations in mind, over say… gameplay and enjoyably.